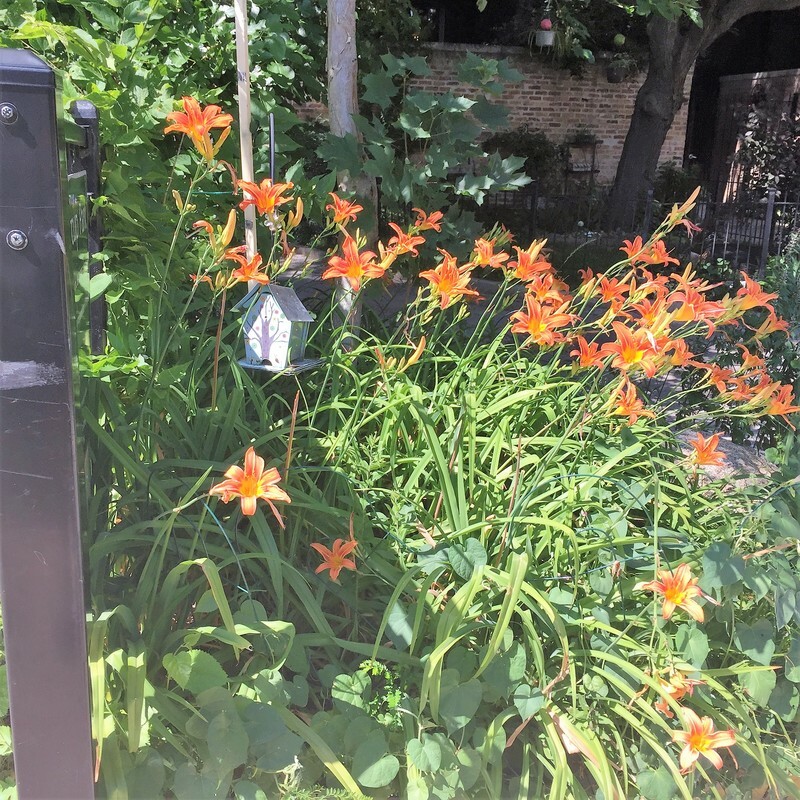 The Heritage Garden tour starts at 7pm at Winthrop Family Historical Garden, (4630 N Winthrop), and tours Uptown's central corridor and Sheridan Road, showing where Uptown's powerful history meets our present through beautiful deep-roots community gardens. 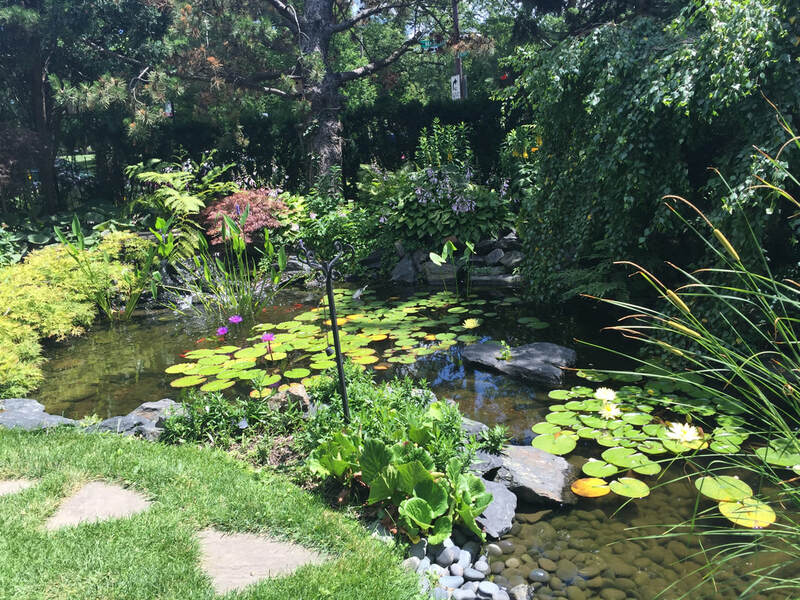 For a virtual tour, see the list of featured gardens below and the map for more details. The Winthrop Avenue Family Historical Garden, located at 4630 N Winthrop, was established by the City of Chicago 46th Ward, Uptown United and the surrounding community to recognize the founding families’ contribution to the Uptown neighborhood and to provide green development in an urban residential setting. The Uptown neighborhood is known for its rich, dynamic history and its mingling of cultures and customs. In the pre-World War II days of restrictive land covenants and legal segregation, the 4600 block of Winthrop Avenue was the only Uptown block available to African Americans to live. Over the decades, however, the neighbors developed tight-knit relationships. Although only one resident from those decades remain, the result was a large extended family that still gathers and refers to themselves The Winthrop Avenue Family. 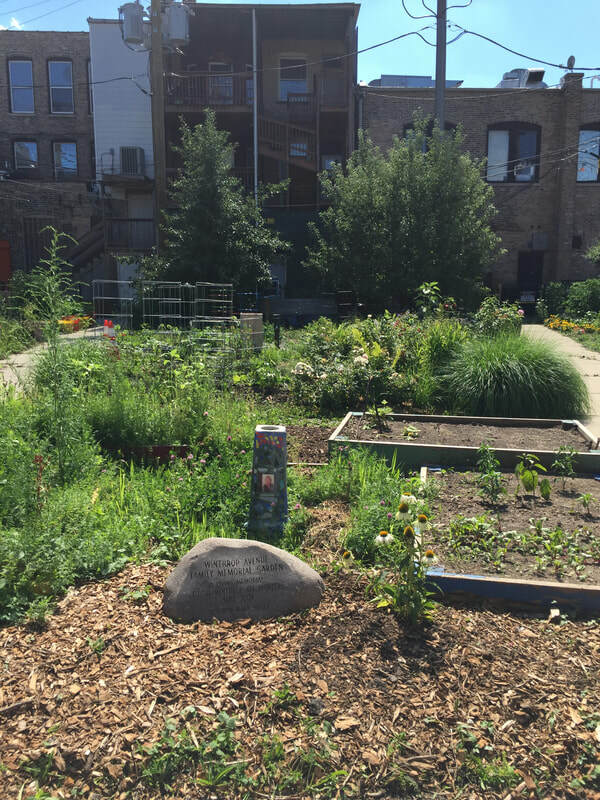 Now, the garden hosts 16 plots that are managed by Uptown residents and organizations including the ICA, JPUSA, Seeds of Joy Daycare, and Thai Uptown. 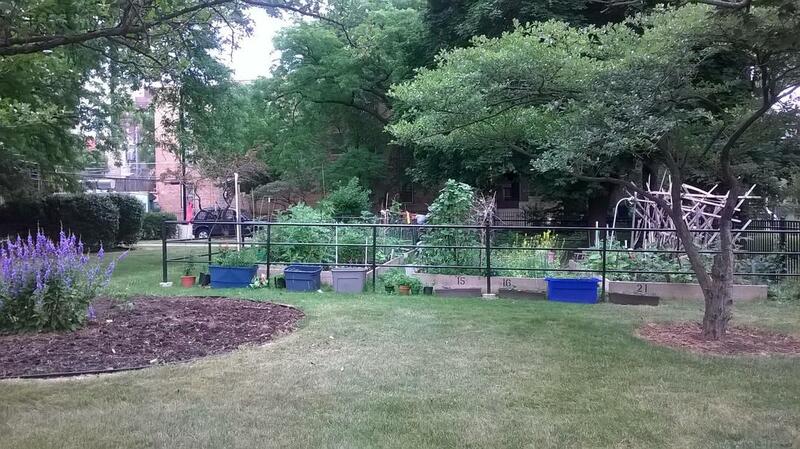 There are regular garden workdays to promote community building among the gardeners. 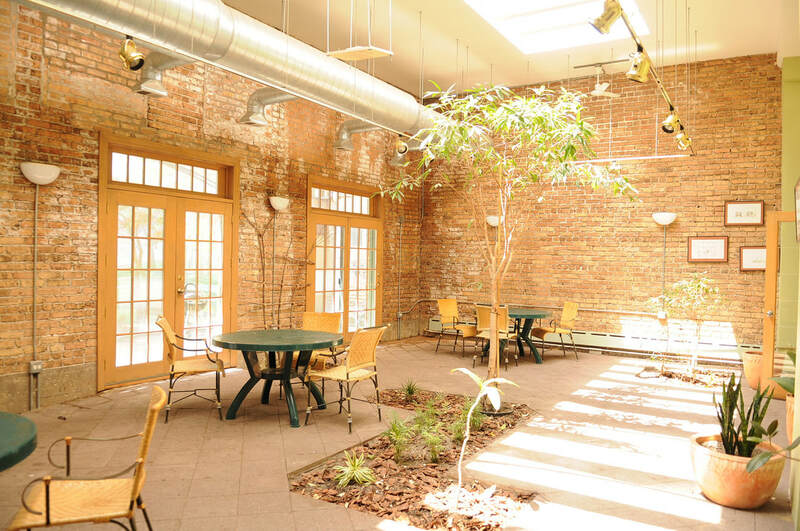 The Lumumba Room is located in the ICA GreenRise building, 4750 N Sheridan Rd., and is a "living room" using the light from the sky light windows to provide energy for plants and brighten up this first floor room. The atmosphere in the room is perfect for meetings, eating lunch, and enjoying a summer cookout. The room's namesake is Patrice Lumumba, the first democratically elected leader of the Congo, who was assassinated shortly after being elected. Lumumba's devotion to fighting injustice, oppression and exploitation has always inspired the ICA's mission. The Lumumba room is cared for by Joseph Carr, a dedicated ICA volunteer. He finds that gardening just comes naturally to him. He was raised on a family farm in Tennessee, so vegetable gardens have always been a part of his life. He developed a love of indoor gardening and plants as way of bringing the outdoors in—very helpful to the spirit during those dark winter months! Now that he lives in the city, it’s a way for him to stay connected with his favorite hobby while living in an apartment. Container plants and houseplants are the only choice. He loves and enjoys it all! 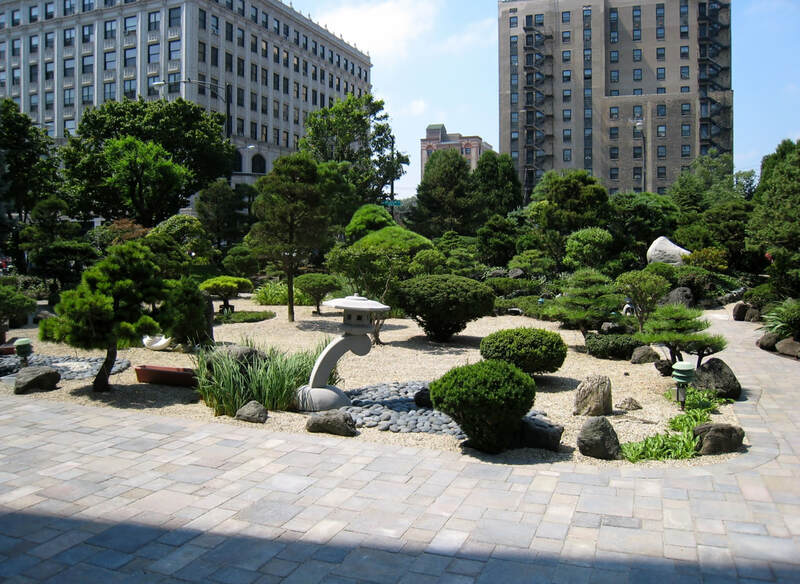 The garden at 920 W. Lawrence has cherry blossom trees, magnolia, Japanese Snowbell, several Bonsai trees, various evergreens, and Japanese Maples "Bloodgood" and "Shishigashira". During the spring, we have Irises and Day Lilies that bloom every year. There are many other perennials and annuals that give the garden a pop of color here and there. Many first and second generations Japanese Americans participated in the 'Adopt A Tree Program" and donated many of the trees in the garden. Castlewood Terrace is on the National Register of Historic Places; the street is lined by large, historic homes that were previously home to Uptown film stars in the 1920's. Today's residents may be more modest, but they are still invested in beautifying the area for all residents to enjoy. The gardeners who tend to the Castlewood plot at the corner of Castlewood & Marine Dr. were inspired by their own pasts, noting that "We grew up on a farm full of flowers. Like to give it back." Buttercup Park, located at 4921 N Sheridan Rd, was renovated in 2012 and opened in 2013. We had permeable pavers and bioswales installed to abate storm water flooding. Indigenous plants were installed along with new trees that were placed among the older mature ones. Different gardens areas have been created around the perimeter of the entire park. Farmed by residents of the William Castleman Apartments, the community garden springs to life every year and is a hive of activity all summer. The creative trellises that often reuse found materials such as large branches are a particular joy for passersby. 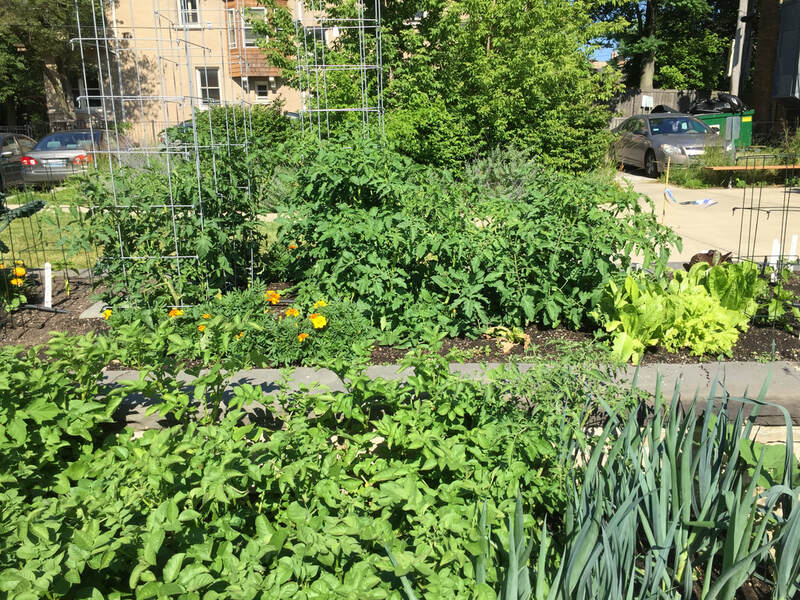 The raised garden beds of Winthrop Harmony Arts Garden grow vegetables, flowers and fruits and flourish on the footprint of what was once a three flat residence in Uptown. The garden teams that collectively grow food here include: Green Scene Chicago (who founded the garden in 2013 and seasonally employs teen apprentices on the site), Chinese Mutual Aid Association, Chicago Uptown Ministry, Vietnamese Association of Illinois and five neighborhood families. 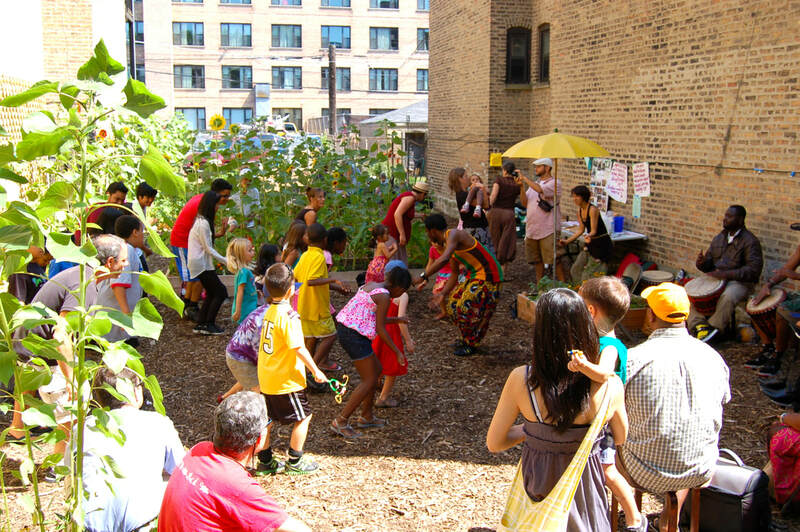 Winthrop Harmony Arts Garden serves as a community garden, teaching garden, and arts venue for outdoor neighborhood performances and the theatrical offerings of local performing artists and Green Scene’s Summer Stock Teen Ensemble. More at www.greenscenechicago.org.